Rob and Penny Paisley could not have timed it better to develop their herd of Beef Shorthorns, and for the past decade they have ridden the wave of popularity the breed has enjoyed. They tell Marie-Claire Kidd how the Shorthorn’s position in their business has grown and evolved, driven by their fondness for these biddable cattle. West Moor House Farm is a windswept place for much of the year. Characterised by grouse moorland, jackdaws and breeding waders, this upland farm comprises 130 hectares (320 acres) of marginal grassland and 220ha (540 acres) of heather moorland. The Paisley family arrived here as tenants 56 years ago, and Rob Paisley, who runs the business with his wife Penny, was born here. With help from Rob’s parents Paula and Joe, the couple breed pedigree Beef Shorthorn cattle, a hill flock of pure-bred Swaledale sheep, a commercial flock of Texel cross ewes and two rare breed flocks of Greyface Dartmoor and Welsh Badger Face sheep. Over the past 15 years, Rob and Penny have steered the business towards rare breed beef and lamb, and sales of live animals. Used to keeping 700 commercial ewes, they have reduced the number of sheep they breed as butchers’ lambs and increased the number of cows and rare breed sheep they graze, many of which they sell as breeding stock. Rob says: “We dropped the number of sheep to make way for the cattle. There was more interest in the cattle for us. My mum always liked Beef Shorthorns and we derive a lot of pleasure from keeping them. “It evolved really. We kept Shorthorns for eight years before we went pedigree. We were crossing pedigree cattle and we thought this was a waste. Today the in-bye flock, grazed on enclosed land below the moorland, comprises 230 Texel cross mule ewes which lamb from mid-March onwards. They are tupped by Texel or Charollais tups to produce prime lambs for sale from July onwards. They are mainly sold deadweight to Woodheads, Colne, and destined for Morrisons, or to Rowland Agar, Ilkley, an abattoir business which markets locally produced meat to butchers through its Three Dales brand. 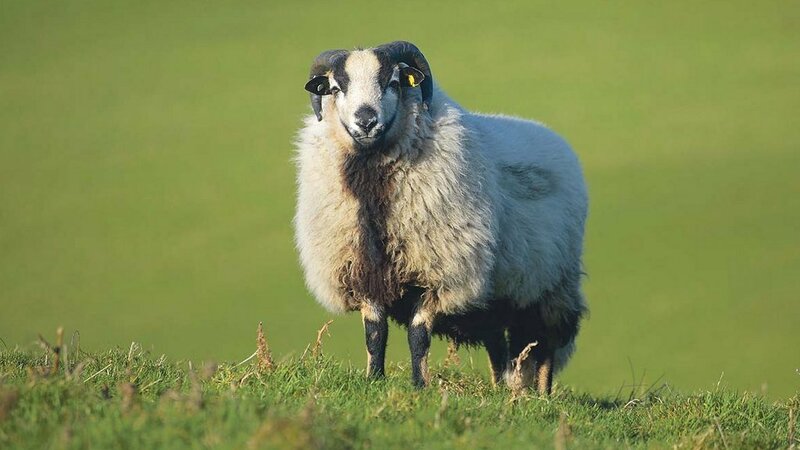 The hill flock consists of 160 pure-bred Swaledale ewes, which start lambing at the beginning of April. Ewe lambs are used for replacements and male lambs for sale direct to the public as prime lambs from October to February. Penny bought a small flock of Greyface Dartmoor ewes in 2011. “They are a biddable breed with lots of character and wool,” she says. “Nobody can walk past them without saying ‘what are they? Aren’t they sweet?’ They are incredibly cute. But, she adds, it would be a mistake to assume they can thrive on the moors of Yorkshire because their name suggests they are a moorland breed. The family shows their Greyface Dartmoors at the breed society’s northern show at Ripley, and at Malham Show every August bank holiday. And in 2012 Paula lambed her flock of Welsh Mountain Badger Face ewes for the first time. The rearing of Beef Shorthorn cattle has become a major part of the farm business. Reared traditionally on grass, these animals are sold as breeding stock or slaughtered for sale directly to customers. The Paisleys largely rely on word of mouth for meat sales. “The whole ethos of direct selling is to cut out the middle man and sell a good quality product at good value,” Rob says. Butcher Andrew Seed of Brimham Rocks, Pateley Bridge, dedicates his business to farmers who sell direct to their customers. He hangs the Paisleys’ beef for at least 17 days before cutting and vacuum packing it. The packs are labelled, boxed and delivered locally or shipped round the country. Rob says: “We usually supply packs of 10 or 20kg, allowing us to provide the full range of cuts in each pack. 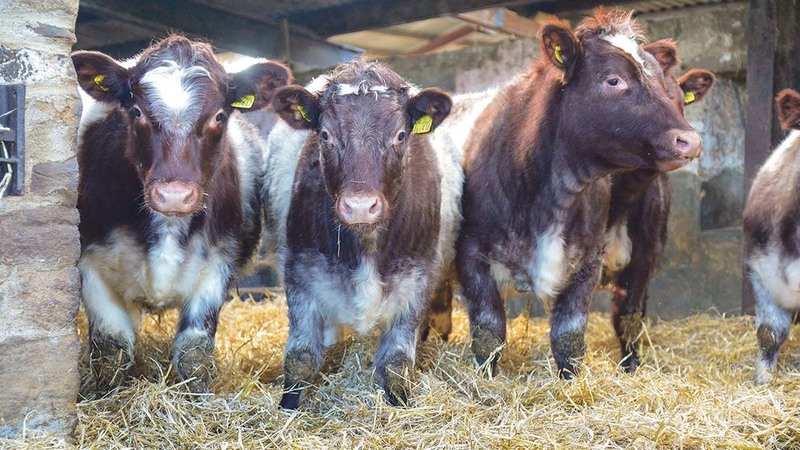 Beef Shorthorns have enjoyed a surge in popularity in the past decade and the Paisleys have discovered an enthusiastic market for their breeding stock. They sell heifers at the breed society’s sale at Skipton, and a small number of bulls privately off-farm. “There’s good demand for quality breeding females. There are a lot of people coming into the breed. We got in quite early and it took off after we got in. Rob is a former director of the Beef Shorthorn Cattle Society and is still an active member, hosting a visit from the society’s Scottish Club in September. He admits the family gets attached to its animals. “Lots of farmers have a favourite or a pet. When you’ve had cows for 10 or 12 years it isn’t easy to let them go. We try and make sure they have a good life. “Maybe we’re soft but when you’re halter training and in daily contact with them, you do build relationships. Penny’s writings and photographs of farm life can be seen on the farm’s Facebook account – the family’s way of sharing their experiences with customers and the non-farming public. She documents the changing seasons, the vagaries of the weather, the antics of animals both wild and domesticated and observations of nature. She spins true, humorous stories of Jackdaws in the wardrobe, Red Kites causing the hens to run for cover and the wading birds which nest on-farm. It’s clear the couple embrace the environment as part of their business and the farm has entered the Higher Level Stewardship (HLS) scheme in an attempt to slow the decline of upland breeding populations of waders and farmland species. “It’s important to us financially and as a way of farming,” Rob explains. The moorland is owned by a grouse shooting syndicate which shares its management with the Paisleys. They observe maximum stock levels on the moors, taking stock off potential nesting sites at nesting times. Sheep are wintered on the moor, unlike on many HLS farms. Rob says: “We’re trying to improve the grassland and maximise grass production, not through fertilisers but through good management. We’re doing a lot of sward lifting and subsoiling to break up any pans and get better drainage. “Most of the farm has been drained but the water isn’t reaching the drains. We have to do a lot of stone picking, which is labour intensive, but it’s worth it because the drainage is much improved. There is a lot to do at the farm and, as Rob’s parents get older, the family is preparing to employ reinforcements. “We’re contemplating getting some part-time help,” Rob says. “My parents are beyond retirement age and although they are still active, their role has reduced quite a lot.